SPORTLINE 2-Cycle Motor Oil is specially designed for use in 2-cycle motorcycles, ATVs, scooters, mopeds, golf carts and go-carts. It can also be used in 2-cycle snowmobiles, chains saws, snow throwers, lawn mowers, trimmers, blowers, and other lawn and garden equipment. This high performance formula features a unique combination of synthetic, polyisobutylene (PIB) and base oils, blended with select detergents/dispersant and anti-wear agents. 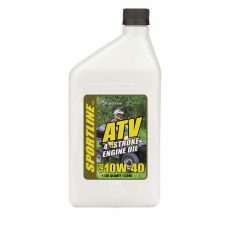 SPORTLINE 10W-40 4-Stroke Motorcycle Engine Oil is formulated with a new additive technology for all liquid or air-cooled gasoline 4-stroke high performance street and racing motorcycles. This technology protects not only the engine, but the transmission and clutch system, insuring smoother shifting, protection against slipping, and long drive system life. 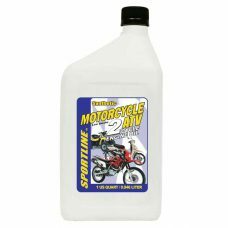 SPORTLINE 20W-50 4-Stroke Motorcycle Engine Oil is formulated with a new additive technology for all liquid or air-cooled gasoline 4-stroke high performance street and racing motorcycles. This technology protects not only the engine, but the transmission and clutch system, insuring smoother shifting, protection against slipping, and long drive system life. 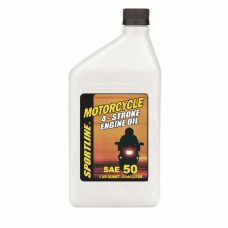 SPORTLINE SAE 50 4-Stroke Motorcycle Engine Oil is specifically formulated with anti-wear characteristics that extend engine life and protect against oil breakdown at high temperatures in older Harley-Davidson? V-twin engines. 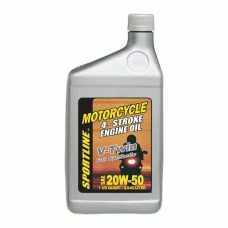 SPORTLINE V-Twin Synthetic 20W-50 Motorcycle Engine Oil is an advanced four-stroke synthetic motorcycle oil for outstanding protection in four-cycle, V-Twin type engines – particularly those that are air-cooled and tend to run hotter than other types of engines. Designed to help provide the proper frictional characteristics necessary for wet-clutch common engine/transmission systems, delivering unsurpassed performance under severe race operation, air-cooled operating conditions and in any driving condition, from mild to severe such as racing. 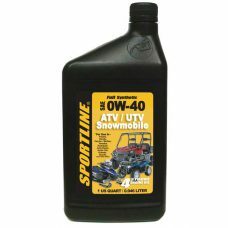 SPORTLINE ATV Genuine 4-Stroke 10W-40 Motor Oil is petroleum engine oil is formulated with shear stable polymers, high performance base stocks and a new generation of high-tech, state-of-the-art detergent, dispersant and anti-wear additive package designed to meet the lubrication demands of today’s high performance ATV engines, transmission and clutches. SPORTLINE ATV/UTV/SNOWMOBILE SYNTHETIC 4-STROKE SAE 0W-40 is a full synthetic motor oil compounded with a specially formulated additive system to ensure the ultimate in performance, protection and maximum horsepower 4-Cycle All-Terrain Vehicle (ATV), Utility Vehicle (UTV), Snowmobile, Motorcycle and 4-stroke Outboard engines. SPORTLINE ATV/UTV/SNOWMOBILE SYNTHETIC 4-STROKE SAE 10W-40 is a full synthetic motor oil compounded with a specially formulated additive system to ensure the ultimate in performance, protection and maximum horsepower 4-Cycle All-Terrain Vehicle (ATV), Utility Vehicle (UTV), Snowmobile, Motorcycle and 4-stroke Outboard engines. SPORTLINE ATV/UTV/SNOWMOBILE SYNTHETIC 4-STROKE SAE 10W-50 is a full synthetic motor oil compounded with a specially formulated additive system to ensure the ultimate in performance, protection and maximum horsepower 4-Cycle All-Terrain Vehicle (ATV), Utility Vehicle (UTV), Snowmobile, Motorcycle and 4-stroke Outboard engines.